It has been a very busy and productive half term at Dame Tipping. 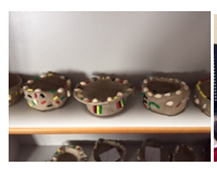 It has been a pleasure to see the children developing and learning so much in just 8 weeks. The Reception children have settled in extremely well and the older children are rising to the challenge of our new way of working, becoming more independent every day. Thank you to everyone who came to our Harvest Festival at the church yesterday. I am sure you will agree that the children did a great job of leading the service and the singing was lovely. Thank you, also, for all the food gifts which you brought along. The year 6 children distributed them to the retired people of the village in the afternoon and they were very much appreciated. 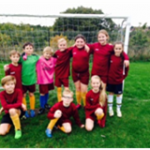 Our mixed year 5 and 6 football team played a friendly match at Holly Trees Primary School yesterday. Whilst they didn’t score the most goals, their attitude was excellent and they were very determined. We look forward to taking them to more fixtures in future. Thank you to Coach Del and Mrs. Potts for organising the match. 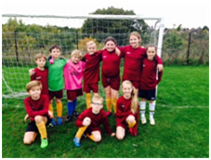 Our Year 6 team also played Clockhouse earlier in the week and did a brilliant job against such a big school. Due to low numbers at Year 3 and 4 Tag Rugby, coach and I have decided to turn this club into a mixed Year 3-6 football club. Tag Rugby club members can still come along. 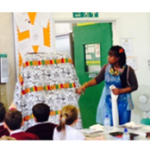 The cost is £15 per half term. We would love to see more girls join in. Please note that this club (Wednesday 3-4pm) is not open to Year 5 and 6 boys already in the Tuesday Football club/team. There are 12 places available. After half term, all pupils in years 3-6 will be able to have a hot or cold 5” baguette with a side order for school lunch. Please see our school notice board for more details. Please see attached a flyer for an after school Dodge Ball club, which one of our pupils attends and highly recommends. ‘Flora’ are running a ‘tubs’ for tablets promotion which will help us to purchase some tablets for the school. Please see http://www.flora.com/get-involved/tubs4tabs for more details. 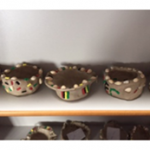 Mrs. Bimpong and Mrs. Emechebe have been working with all the children today, enabling them all to have a go at traditional African Arts and Crafts in celebration of Black History Month. 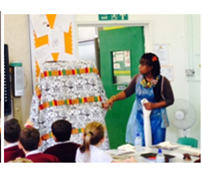 The children learnt a lot about African traditions through these activities. As part of their Fairground topic, Class 5 and 6 have constructed working fairground rides with working parts, light and (in some cases) sound. 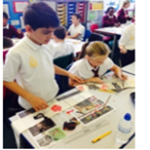 Class 5 and 6 parents are invited to come and see their children’s work on Wednesday 4th November at 3pm. Don’t forget to return your ballot papers to the school office by the Monday after half term. Well done to class 3 and 4 and class 5 and 6 for attendance over 97% this week. Jeremiah Oyetunde, Krish Patel, Amber Gordon, Harry Newman and Louise Stafford. Well done to Amber Gordon, Jack Robinson, Elaina Goodison, Dylan Alexander, Sidonie Holmes, Neve Collins (x2), Jessica White, Joshua Airen, Josh Thurbon, William Smyth, Mikey Snow, George Dignum and Scarlett Clarke for earning their place in the Gold Book. They have all displayed excellent learning behaviour. Monday 2nd November- Return to school after half term.